Professor Emeritus Albert Overhauser has received the 2009 Russell Varian Prize. The prize, sponsored by Varian, Inc., honors the memory of the pioneer behind the first commercial Nuclear Magnetic Resonance (NMR) spectrometers and co-founder of Varian Associates. The prize recognizes the initial contribution that laid the ground for the specific technology of great importance in state-of-the-art NMR. The award ceremony will take place at the EUROMAR 2009 meeting in Göteborg, Sweden, on July 5, 2009. In 1953, Professor Overhauser delivered a talk to the American Physical Society on Polarization of Nuclei in Metals. The lecture was subsequently published in Physical Review (Volume 92, pp. 411-415) and cited over 500 times. His findings led to the development of two important techniques in modern NMR: the Nuclear Overhauser Effect (NOE) and Dynamic Nuclear Polarization (DNP). NOE describes the mutual influence of the polarizations of two spin species by spin-lattice relaxation. Originally, the spins were those of the nuclei of a metal and those of its conduction electrons. Soon after Prof. Overhauser's prediction, the effect was demonstrated by C. P. Slichter on metallic lithium, and was shown by Ionel Solomon to also exist between different nuclei in ordinary liquids. The NOE has played a key role in liquid state NMR over several decades, notably in establishing the overall structure of biological macromolecules in solution. DNP describes the enhancement of nuclear polarization by strong irradiation of an electron resonance in the sample. Particularly within recent years, DNP technology has evolved considerably to a powerful sensitivity enhancement method in a growing variety of NMR applications. 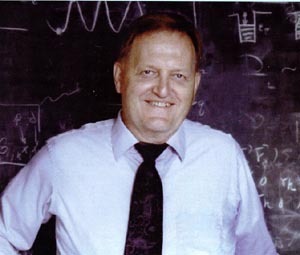 Professor Overhauser has been the Stuart Distinguished Professor of Physics at Purdue University since 1974 and a member of the National Academy of Sciences since 1976. He was awarded the National Medal of Science in 1994.